You’ve made the right decision by purchasing Customer Relationship Management (CRM) software for your insurance agency. It can be a game-changer for your business by elevating sales, marketing, communication and services… if you know how to get the most out of your CRM. Before you can delve into the many ways CRM technology can help you strengthen your brand and increase revenue, you have a choice to make. An insurance management system can help you improve efficiency, manage leads, and, ultimately result in unprecedented sales growth, but finding the right CRM software can be challenging. Choose comprehensive insurance CRM software. Consider the wide range of features with potential to meet the demands of your agency, and recognize the importance of support that continues well after installation and set-up. With Quotit’s CRM software, for example, you can streamline your processes and produce presentation-ready, accurate quotes, and you’ll also have a support team available as you explore all the ways to integrate your CRM into your day-to-day insurance business. Once you’ve chosen dynamic CRM technology that will meet the demands of your business, let’s make sure you see both short and long-term returns on your investment. Getting the most out of your insurance CRM software may take some coordination to implement and understand its full potential, but the maximized productivity, increased prospects-to-sales conversion, and improved client relationships will be well worth your time and effort. Let’s discuss some insurance CRM software tips that can help you get the most out of your CRM system. Focus on your agency’s specific needs. A CRM can have many features, but you need to focus on your agency’s needs and simplifying processes for the sales agents. Determine which aspects of the CRM will streamline your day to day activities. Don’t overwhelm yourself, or your employees, with too much too quickly. 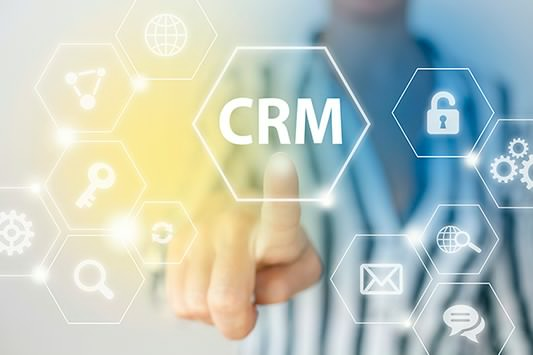 It can be tempting to embrace an all-out transition to your CRM overnight, but successfully integrating a CRM tool may require a more gradual implementation. Take time for education and training. Time is money – and it’s difficult to take time away from your sales efforts for training, but learning to use the insurance CRM software effectively is crucial for your agency’s success. Consider all of the different people who will be accessing the information in the CRM, and design training to meet those individual needs. Your first priority may be training sales agents, but it is just as important to give support staff, service technicians, and your marketing department access to the features and capabilities of your CRM. Understandably, there may be security and privacy issues that will dictate different fields of vision for various departments, but any employees who can use the features of the CRM to improve their productivity should be trained on how to use it. Having everyone on the same page will ensure seamless communication within your organization. Data that goes into the CRM drives your ability to track leads, determine prospect conversion to sales rates, and much more. The accuracy and timeliness of this information can be vital in propelling your agency’s sales and marketing success. Making a commitment to cleaning up data consistently and frequently will allow you to use analytics to determine the success of sales and marketing efforts. It will keep agents from wasting time on duplicate records or outdated information. Software updates of the CRM itself can keep data vulnerabilities at a minimum and should be scheduled regularly. CRM software is most effective when it can be integrated with existing tools. Insurance CRM technology should be customized to connect to your agency’s website, email, and social media sites. Part of a CRM’s success in helping agents manage daily tasks depends on the system’s link to other resources, including marketing automation tools and the agents’ calendar. Keep the lines of communication open as you integrate the insurance CRM software into your agency’s operations, and consider the feedback you get. Listen to your employees and determine what is working for your employees, and what is not. Giving your employees a voice will help them buy into the new processes and improve internal morale and communication. Promote the value of your products and services – and emphasize the online, 24/7 quoting engine that will give your customers access to plan information, proposals, and information at their convenience. Generate and track leads to better focus your marketing efforts, including online advertising, social media posts and networking connections, and more traditional campaigns, including direct mail. Cultivate your current client relationships to encourage referral business, and consider implementing a referral rewards program. Encourage your brokers to delegate some of their daily tasks to the CRM, and use their “free” time to reinforce their position (and your agency’s reputation) as a trusted insurance industry leader by hosting information events, organizing webinars, and contributing to blogs. Use insurance CRM software to your advantage. It can be challenging to change the way you do business, and asking your employees to do the same can be equally daunting. Insurance CRM technology can make a huge impact on your bottom line, streamlining daily tasks so your insurance sales agents can get down to business, building client relationships, and ultimately, increasing sales and revenue. Take advantage of comprehensive insurance CRM software, get a competitive edge in the industry, and elevate your business to new heights of success.